The Rubric Marines are marching in their dust-filled armor to attack the tabletops of Kill Team games around the world. 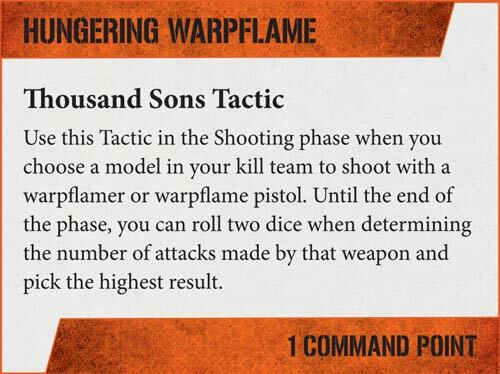 So how will the Sons of Magnus function on the tabletop? Let’s take a look and find out! What makes the Thousand Sons really shine in Kill Team is that just like the Grey Knights from yesterday, they have access to Psybolt as a psychic power. 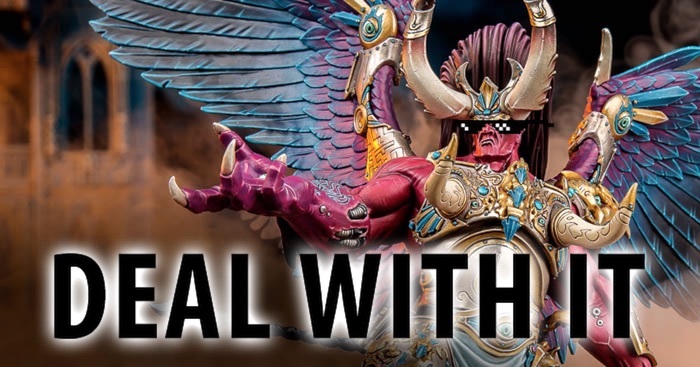 Again, we covered why having psychic dominance is a good thing and a Kill Team of Thousand Sons will be able to sling mindbullets unopposed (unless you’re facing Grey Knights or another Thousand Sons Kill Team, naturally). 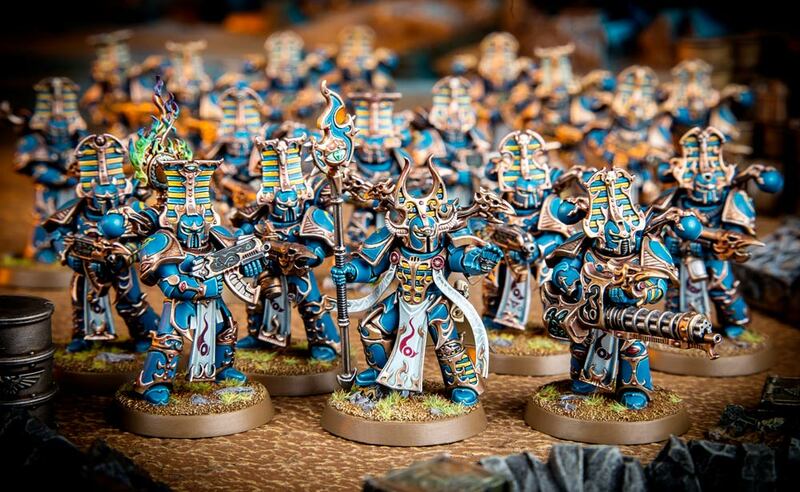 The Thousand Sons also have those armor-shredding inferno bolters. AP still matters in Kill Team and yes, those inferno round are going to leave a mark (of Tzeentch). And that’s just their basic firearm. Don’t forget those nasty Warpflamers they have access to as well. Who cares about “to hit” modifiers when you’re spitting hot warpfire! Aspiring Sorcerers are going to be leading your Kill Team in most cases. They are also going to be the one you’ll likely be using to sling those Psybolts around the board. 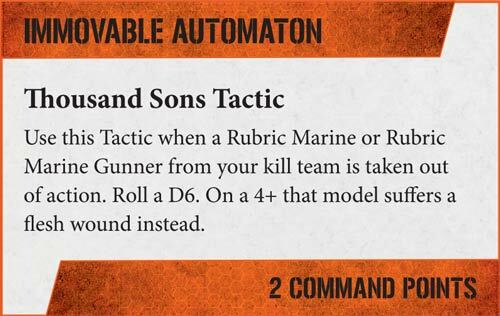 Next up, you can’t have Thousand Sons without those Rubric Marines who are definitely in – and they are bringing their +2 saves to bear! 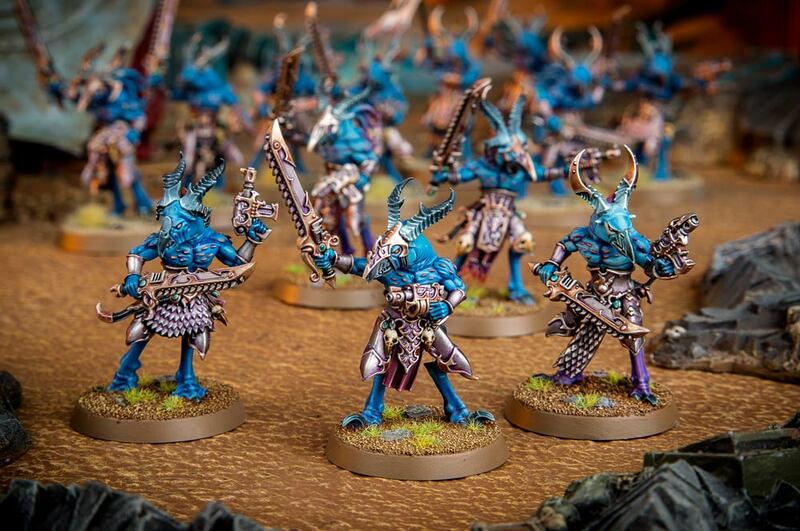 Finally, Tzaangors are perfect filler models. They bring some much needed speed and a solid close-combat punch. There are few things less satisfying in 40k than rolling a 1 for the number of shots your weapon gets. The disappointment is real. But now you can hedge your bets with this 1 Command Point Tactic. Hungering Warpflame allows you to roll 2 dice and pick the highest for your warpflamer or warpflame pistol. I’ll take those odds! Immovable Automaton is a 2 CP Tactic but it gives you a 50/50 shot to ignore an Out of Action result. That’s kind of a big deal! It could save your Aspiring Sorcerer from leaving the battlefield early! It certainly adds some extra durability to an already incredibly durable Kill Team. The Sons of Magnus might not say much but they get the job done! Are you ready to face the ‘Rubes’ on the tabletop?